Have you ever worried about breaking a chair in public? Or trying to sit somewhere you literally don't fit? Our world wasn't designed with large bodies in mind. But AllGo is here to help. 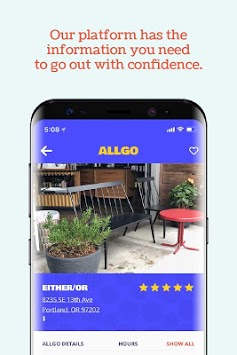 This version of AllGo is now live in Portland, Oregon. Please check it out! Check out our website for the latest news about our plans to expand! That's OK! We need your help too. 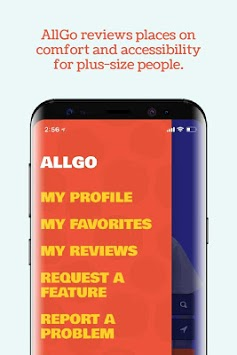 Please download the app and start reviewing so plus-size people can have access to the information you provide! She felt the same way when she was just 18 and agonized about going to Six Flags with her high school class. She went anyway and spent the day walking around the giant theme park, playing a game of chance: Will she fit on this ride, or will she have to embarrassingly stay on the sidelines while her friends ride without her? 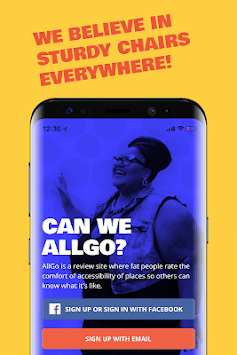 She founded AllGo because, as a fat woman, she has spent countless hours scouring the internet to reduce her anxiety about going to new places. Rebecca wants to make the information plus-size people want easier to find. And ultimately, she hopes the world will become more accommodating for people of size.